Our tour of Germany comes to an end this week with the state of Mecklenberg-Vorpommern (or, as I'm going to refer to it as to avoid constantly misspelling 'Vorpommern', Mecklenberg-West Pomerania). Meck-Pomm rounds us out not only with an interesting flag, but because of the ancestral roots of The Missus' maiden name, 'Bandow'- wherever the first Bandows came from, they came from here, so I think it's nice to give the place a shout out! The northeastern 'shoulder' of German, Meck-Pomm is the band that just keeps getting back together. They were apart, they merged after World War II, split again in 1952 and got back together once more after German unification in 1990. They are, if that's possible, kind of like the Alaska of Germany in that they're one of the larger states (6th biggest by area) but it's also the least densely populated state. A glance through their delightful Wikipage reveals it to be a scenic and beautiful place right along the Baltic Coast. And, random factoid: The University of Rostock (est 1419) and the University of Greifswald (est 1456) call the state home and are among the oldest universities in Europe. When the band got back together in 1990, there were actually five different flag proposals put forward for the new state, but none were really liked by German vexillologists and if you go and look at them, you can sort of see why. (Proposals 1 and 2 aren't bad, but don't exactly make your socks go up and down either. Proposal 3 is just... weird. Like a picture in picture TV but in flag form. Proposal 4... just no... the different widths of the stripes just mess with my head. Proposal 5 seems like a decent design but there needs to be fewer colors.) So, a member of the Meck-Pomm parliament by the name of Norbert Buske came up with the we see right here. Basically, the flag is a merger of symbols and flags of both regions that made up the new state. The flag of Mecklenberg was a horizontal tricolor of blue-gold-red, while the Prussian Province of Pomerania had a bicolor of blue and white (which had been around since 1882.) 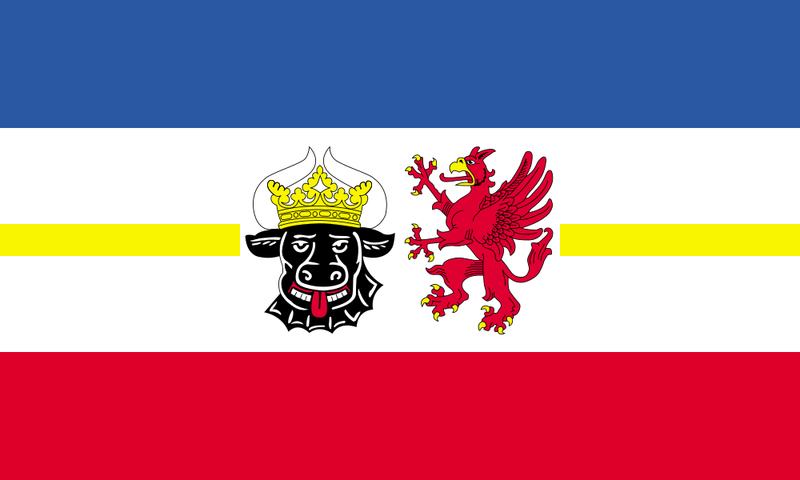 The two symbols in the center reflect the merger as well- the bull's head is seen on the arms of Mecklenburg, while the red griffin hails from the arms of Pomerania. The actual arms of the state also include the eagle of Brandenburg, but don't get included on the flag. I'm not sure why this flag gets the haterade flung at it from professional vexillologists. I think this is a perfect pleasant looking merger of the two states... I will agree that the yellow line running through the middle is a little distracting, but not ridiculously so. And it sure beats any of the original proposals floated in 1990. And that's the end of our German tour... remember, until next time keep your flags flying, FREAK or otherwise!